“We have seen some press reporting to that end. 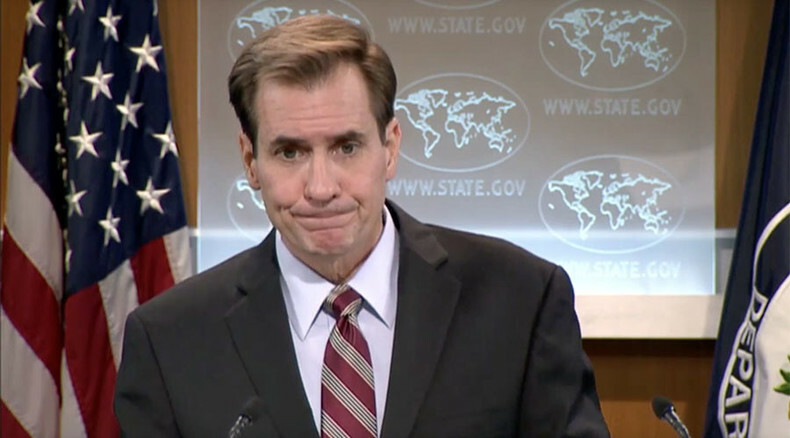 We have seen some Syrian civil society groups says that,” US State Department spokesperson John Kirby said. He did not name any specific organization or news outlet. Instead, Kirby stressed that the US also has some “intelligence and operational information” but he firmly refused to share it. “I’d tell you that we have some other operational information that lead[s] us to believe that Russian targeting has not only not been focused on ISIS/ISIL but has in fact caused collateral damage and some civilian casualties, to include some civil infrastructure,” Kirby said. Kirby was then asked if he thinks the evidence should be made public. In response, he stressed that he just did so. The US State Department has also refused to say if Washington has ever shared its intelligence showing that it hit hospitals with Russia. “I’m not going to read out our diplomatic discussions and I’ve answered your question, and I think I’ve gone as far with it as I’m going to go,” Kirby said. In the past, the US has been forthcoming with its evidence against Russia supporting alleged attacks. “We’ve seen these reports as well, but in the absence of any firsthand information coming from our teams on the ground, I can neither confirm, nor deny these allegations,” Dominik Stillhart, director of operations at the International Committee of the Red Cross, told RT. While he did not provide evidence proving Russia’s attack, Kirby made an example of the US admitting that it had targeted a hospital in Kunduz, Afghanistan, killing at least 22 people. He said nations accused of killing civilians should look into those situations. “We would expect the same from any other nation that had reason to believe that it might have caused collateral damage or civilian casualties. We would want to see that nation investigate, and, if possible, if practical, hold itself and anybody else to account should that have happened,” Kirby said. Prior to owning up to “mistakenly” bombing the hospital, Washington changed its position four times in four days – from “not knowing for certain” that it had struck a hospital to blaming Afghanistan for requesting the bombardment. On Tuesday, the Russian Ministry of Defense summoned military attaches of NATO countries and Saudi Arabia, asking for clarifications of their countries' allegations that Russian airstrikes in Syria had hit civilian targets in Syria. The MoD stressed that such blame is put upon Russia not only by the media, but also officials and politicians from a number of Western states, including US Secretary of State John Kerry, US Department of Defense Secretary Ashton Carter, NATO Secretary-General Jens Stoltenberg, the UK's Defense Secretary Michael Fallon and France's Minister of Defense Jean-Yves Le Drian. Russia has been disputing the allegations as well as media reports, having questioned the credentials of the source that the information is based on. It first came from the Syrian Observatory of Human Rights, which is based in Britain and relies on unidentified sources in Syria for its reports. Russia said it would dismiss the allegations as baseless if Moscow does not get proof in the following days. It has not stated whether it will look into the situation.